Don’t Race for the Cure, Juice for the Cure!! | Indestructible Ideas! It is my last semester of my graduate program at the University of Southern California (USC), and by the end of May I will receive a Master’s in Social Work (MSW). Before I started this program I never thought that as a social worker, I would take a film class, let alone do a documentary! Part of my last project in my class, Social Work and the Media, is to do a short documentary on a social issue that is important to us. We had to create a proposal and pitch it to the class. Only 4 documentaries were chosen out of a class of 11, mine being one of them. Those that didn’t get picked became crew members of all sorts. My partner, Crystal Bettenhausen-Bubulka, and I are doing our documentary on the Gerson Method called “Juice for the Cure”. The Gerson Therapy is an alternative, non-toxic treatment for cancer and other chronic degenerative diseases. The Gerson Institute is a non-profit organization in San Diego, CA, dedicated to providing education and training in the Gerson Therapy and has 2 clinics; one located in Hungary and one in Mexico. Currently, cancer is usually treated with surgery, radiation, chemotherapy, hormone therapy, biological therapy, and targeted therapy. 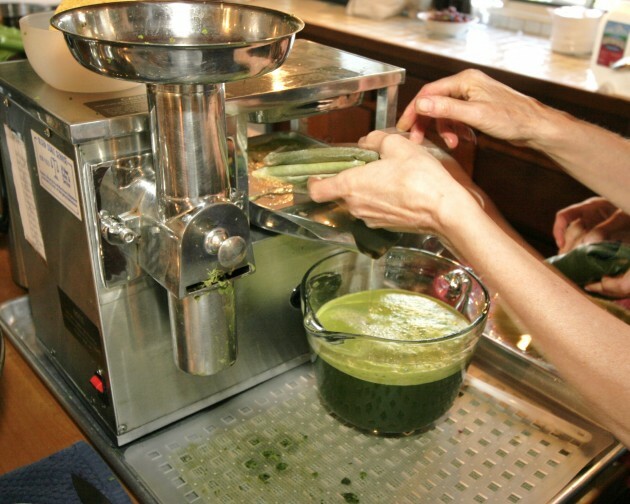 The Gerson Method, however, is a safe and natural treatment that activates the body’s ability to heal itself through an organic, vegetarian diet, raw juices, coffee enemas, and natural supplements. It treats the underlying causes of disease: toxicity and nutritional deficiency. Instead of treating a symptom or condition, as so-called “modern medicine” does, the Gerson Method treats the body as a whole, facilitating healing rather than trying to “kill” a disease. We are able to tell the truth about the epidemic because we are the only national breast cancer organization that does not accept funding from entities that profit from or contribute to cancer, including the pharmaceutical industry. We are thrilled and excited that they are willing to participate in our film and give their expertise. We hope Juice for the Cure sheds light on other ways of treating cancer and/or other degenerative diseases. Moreover, we intend to show that alternative and holistic treatments will no longer be scorned or dismissed by the medical society at large. We should all come from a considerate viewpoint and encourage one another to no longer be dismissive towards alternative cancer treatments, but to see them as a complement to their overall health care options. That’s awesome Gino! I can’t wait to see it! Thanks! I will keep you updated! Pingback: Save the Date!! Social Work Film Festival!! | Indestructible Ideas! Breast Cancer Awareness Month was created by a pharmaceutical company which is a subdivision of a chemical company that produces carcinogens that it refuses to stop selling! Yes we are going to interview the Think Before You Pink campaign to discuss exactly what you just said! Pingback: I Want Organic Food, but I’m Broke | Indestructible Ideas! Pingback: Framing the Future for the 99%! | Indestructible Ideas! Pingback: Think Before you Pink! | Indestructible Ideas! Hi! Sorry for such a delayed response. It should be at the bottom of every page where it says subscribe. Your just put your email. If you have trouble, just give me your email address and I will subscribe you and all you have to do is confirm it. Thank you for the suppprt.